I love nothing more than seeing the influence of different Marketing campaigns, especially around Christmas. 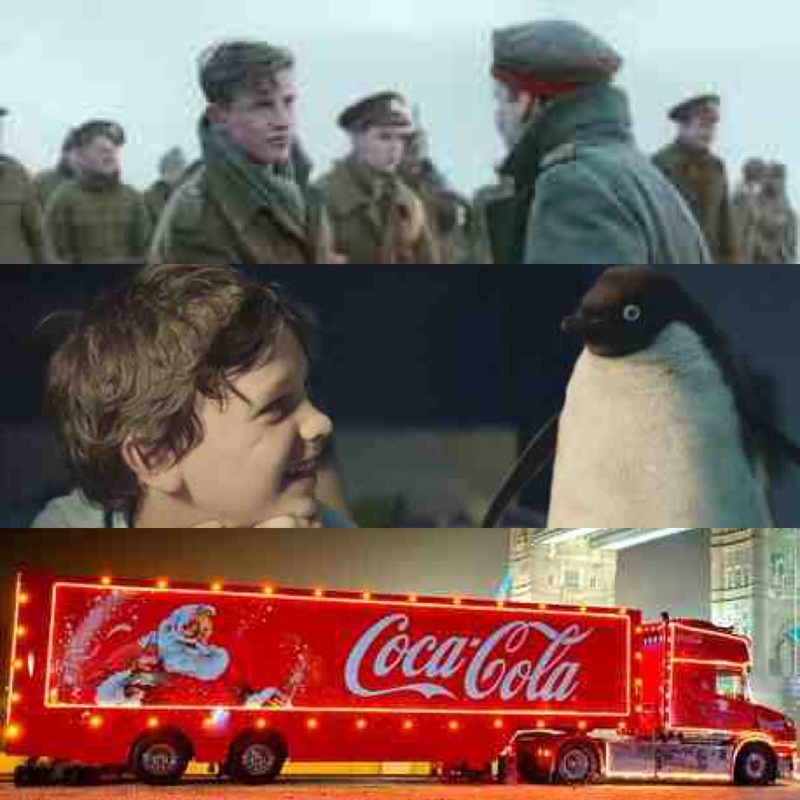 Ads from the likes of Coca Cola and John Lewis have huge hype surrounding them, leaving Twitter to go crazy from their first air date in November through to the end of the festive period. Don’t get me wrong, I adore (almost) everything about Christmas, I’ve already finished my Christmas shopping & desperately want to put my tree up. But I cringe when people are posting online that ‘it’s officially Christmas when… they see the Coca Cola polar bear/Christmas van or John Lewis ad.’ No, that isn’t when it’s officially Christmas at all and I although I think the power of marketing is amazing in these instances, it’s all constructed to make you buy, not to simply make you feel as if Christmas is here and give you a little cry because the penguin is ‘so cute’. Have you seen how much that penguin teddy is selling for? £95! Yes they may have sent loads over to WWF in a hope to boost adoption figures but £95 to buy one from them!? They claim the advert increases the awareness of the need to adopt penguins, but does it? I haven’t seen one post on social media suggesting anyone has received that message. Whilst a report from the Telegraph suggests that adoptions of penguins have increased on last year, the numbers are ridiculously low in comparison to the number of people who have seen the advert. OK, so John Lewis are doing their bit and donating money from the sale of their CD to the Adopt a Penguin Programme, just how many people are going to buy the CD? Most likely a very small number in comparison to the cuddly toys sold at John Lewis, which have already sold out and attracting bids of up to £150 on eBay! I understand it works for John Lewis, there are numerous reports online suggesting profits are up since it first aired, but it just doesn’t sit comfortably with me. This is where I can quite happily welcome the new Sainsburys Christmas ad. Yes, I know this is created for the same reasons as above, but everything about it oozes sincerity. If you haven’t seen it, I’m sure less people have as it doesn’t feature a cute child or animal, click here. Sainsburys have teamed up with the Royal British Legion to create an advert fitting for the 100th anniversary of the start of WW1. The video features the rare truce of Christmas 1914, where both British and German soldiers ventured into No Man’s Land to greet one another, exchange gifts and even have a game of football. Whilst some may see this collaboration as a little bizarre, I think it’s genius. The ad features a chocolate bar sent to the British soldier who then gives this to a young German. The chocolate bar will be sold in Sainsburys stores and all profits will go to the Royal British Legion, isn’t that what Christmas is about? OK, Sainsburys will receive a lot of positive PR for this, enhancing the brand and hopefully they’ll see consumers associating themselves with the holiday and purchasing with them. But I as a consumer am satisfied that we aren’t being exploited in paying £95 for a penguin and seeing John Lewis pocket it all. I’ll very happily part with my hard earned cash to see it go to a cause as great at the Royal British Legion. Marketing is proven to be such a powerful thing, with consumers not even thinking about Christmas until certain ads hit the TV. Why not use this tool for mutual gain like Sainburys have? I’d love your opinions on this, I’m definitely not a party pooper when it comes to Christmas, but £95 FOR A PENGUIN TOY? £95 for a penguin teddy is crazy! I saw the Sainsbury’s advert this morning and I love it! It is a very well made commercial in terms of minute detail, but it does bother me a bit as, as touching as the apparently true story of both sides stopping and playing football with each other awhile, they still went back to killing each other thereafter. I’m sure you could find a touching moment in every war. Perhaps a US soldier finding a Vietnamese child in a field and carrying it to safety, or a member of ISIS who deliberately shot to miss when part of an execution squad, but it’s still war, however you dress it up. It’s picking one moment from four years of strife and destruction and taking the view that by making it a cinematographic masterpiece it’s somehow OK. Plus It’s also very ‘Pipes of Peace’ if you’ve ever seen that McCartney video. i.e. not original. Should the west decide to send troops into Syria to take on ISIS, can one of the supermarket chains not just sponsor the soldiers uniforms, very much like businesses emblazon their logo on football shirts? It would save them millions in production costs in the future and they’d be seen on the news pretty much every day. Hmmm…both adverts are about selling us more consumer goods, increasing profits etc. Let’s not forget, these ads were not produced by Santa’s elves but by advertising executives – manipulators par excellence! I like the John Lewis ad – it’s the nod to a favourite cartoon strip Calvin and Hobbs that does it for me – but it certainly didn’t make me want to buy a cuddly penguin. In fact, when I first saw the ad, I didn’t even realise there was a toy tie-in.